Taken from: An Slean, Vol.1, no.13, January 1945, p.3-4. A very successful invasion operation was carried out on Sunday, 24th December, 1944, and the invading force, amounting to some 200 men, from Mucklon, Allenwood and Killinthomas Camps, were speedily billeted and free to explore the possibilities of Newbridge town. The extent and object of such exploring does not concern us now; it is enough to say that the whole force turned up, accompanied by lusty appetites, for dinner at 6 p.m., and full justice was done to the ample fare provided. Subsequent exploring did not deter the majority of the invaders from attending Midnight Mass in the Parish, and Dominican College Churches, and so to bed. Those who had not been to Midnight Mass now made ready for Church; others played rings, draughts, table tennis etc., until lunch at 1 o’ clock, when the Chief Camp Superintendent, Mr. Stapleton, in a few well-chosen words, welcomed the visitors and wished each and every one a Happy Christmas and Prosperous New Year. The vociferous applause which greeted his speech and the numerous “Same to you, sirs” testified to their appreciation. By the courtesy of the Management of the Palace Cinema, a free show was provided for all. Two pictures, “Below the Deadline” and “Irish and Proud of it.” were shown, and were very well received – especially the latter. The medley of Irish choruses near the end of this film brought down the house. Back to Camp at 5.30 p.m. and a real good Christmas dinner at 6 p.m., this time in No.2 Dining Hall- Menu: soup, turkey, stuffing, ham, vegetable and sweet. Tea was followed by “refreshments.” There seemed to be a great demand for a frothy black liquid, sometimes advertised as being “good for you,” and the supply (and demand) seemed to be limitless. Photographs of the diners, taken during dinner, are reproduced on this page. A special word must here be said for the kitchen and serving staff. They were the hub around which the whole Camp revolved, and it was mainly due to their exertions strenuous as they were, that everyone’s “inner man” was satisfied speedily and in perfect order. Instructor Cook P. O’Brien was in command of the Knights of the White Apron, and under his very capable supervision, Cooks Dan Sullivan, P. Mileady and Tom O’Reilly (A/1); Jim McDonald, Mucklon; Kevin White (Glencree), A. McGurk (Killinthomas) and Jim Willis (Turraun) turned out a feast fit for a king. Among the waiters were Willie Moran, Mucklon; H. Naughton (A/1); Vincent O’Loughlin (A/1); P. Moroney (C/8); J. Cullen (B/7); T. Considine (C/8); W. Daly (A/1); Joe Power, F. McSweeney, A/1, and Andy Shanahan, Mucklon. Mr. Doran, Camp Supt, was in charge of the liquid refreshments, and his efficient handling of same ensured that a steady flow was provided, just where it was most needed. M. Gaines, C/8; T. Callaghan, B/7; W. Dooley, B/7. It intervals during the concert, numerous draws were made for prizes, and the cup that cheers was again passed round, keeping the company in good condition for the choruses! Even the best of times must come to an end, and the National Anthem was sung with vim, the “troops” marching off to their billets arm in arm, singing the choruses they had just heard. Breakfast and dinner on St Stephen’s Day in No.1 Dining Hall were followed by a nine-a-side football match which was won by a team composed mainly of lads from Killinthomas, refereed by Asst. Camp Supt. O’Sullivan; the game was keen and well enjoyed. Killinthomas – P. Lee, R. Nash, M. Kinneally, T. Gleeson, J. McCarthy, H. McHugh, P. McDonald, P. Foley and T. O’Donnell (goal). The Rest – P. Kennelly, D. Corcoran, T. Mahon, J. Toolin, J. Murphy, Con Hayes (all B/3), P. Green (A/1, Ration Van), P. Murphy and W. Dooley (goal). The score was 3 goals 1 point to 1 goal, and the only goal scored by the losers was scored by P. Green. While the footballers were enjoying themselves outdoors, some interesting games of draughts and cards were being played in the recreation room for prizes. Draughts: T. Keenan, B/7, Twenty-five Drive – Partners – Jim Irwin, B/7 and J. Power, A/1; B. Morgan , B/3 and T. Egan, C/8; J. Devaney, B/3, and P. Duffy, B/3; James Egan and B. Morton, A/1. Single Games winners, T. Carr, B/7; John Gaynor, B/7. Mr Hoban, Camp Supt., presented the prizes and congratulated the winners. Tea was followed by a free Social which rounded off nicely a perfect two days. Camp Superintendent T. Sammon, Droichead Nua Camp, was in charge of the arrangements, assisted by Superintendents W. Doran and Hoban, while the Assistant Superintendents on duty were Messrs. J. O’Rourke, J.B. O’Sullivan, T.J. Stone and C. Steinmeyer. On Wednesday afternoon the “invading force” left for their “Home” Camps, cheering and yirruping, to take up the extension of the “bulge” already created on the bogs. “The best yet,” was the unanimous verdict of the turf workers on the Christmas festivities at Edenderry (D/9) Camp. Right from the moment when the men arrived in Camp from Derries, Shean and Drummond, nothing was left undone to make their stay “a home from home,” and the efforts of Camp superintendent J. Leahy (who was in charge of the arrangements) and his staff, bore ample fruit on Christmas night when a sumptuous dinner was partaken of in a gaily decorated dining hall. The eager, happy smiling faces bore testimony to the appreciation of the men, and even the stoutest appetites were surfeited before the close. The musical items opened with a selection of Irish airs by C. Sheehan, Medical Orderly, Edenderry, on the accordion, and S. Whelan (Edenderry) piano. The rousing airs of the “Men of the West,” “Kelly from Killane,” “God Save Ireland,” etc., were lustily chorused by the audience, and the orchestra then swung into “Songs of the Counties.” The rafters rang with “Rose of Tralee,” “Moonlight on Mayo,” “Galway Bay,” “ Rose of Mooncoin,” “Boys of Wexford,” “Hills of Donegal,” “Clare’s Dragoons,” each county getting its own favourite until we were transported on a magic carpet of fantasy through the rolling uplands of Kildare, Dublin and Meath to the hilly fastnesses of the North, and down the rugged Western sea board to the Shannon’s mouth and Tipperary’s hills, and Kerry’s mountains. Many a mind went back in fancy to crooked streets of country towns and white-washed cottages on hill and valley, but all sang together of other Christmases, and were happy in their unison here. Mr. Leahy, proposing the toast of “Our Guests,” thanked Mr. Stapleton, Chief Camp superintendent, for his attendance, and congratulated the men on their bearing and conduct during their stay in Edenderry, which were matters of favourable comment by the townspeople. They, that night, he said, were the rear guard of the scheme, and when the work re-opened next year they would constitute the advance guard of a nation’s army engaged in the vital battle of fuel production (applause). Mr. Stapleton, speaking to the toast, said it was the aim of the management and staff to make this Christmas as happy as it was possible for the workers who had remained as the guests of the T.D.B. That this effort was crowned with success was very obvious from the happy faces before him. He was satisfied, he continued, that this Christmas would be long remembered. The Superintendents and Staff on duty had worked as one splendid team and deserved every congratulation. Camp Superintendent J. Wilson proposed the toast of “The Staff,” and said he could find no words strong enough to praise the work done by the kitchen staff and orderlies in Edenderry Camp to make everybody’s stay pleasant. His call for three cheers for the Staff was enthusiastically responded to. 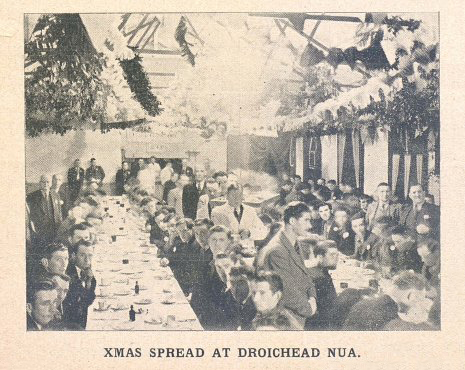 Stirring sight of the night was the mass singing of National Anthem after the toast “Eire” had been honoured, every man left the hall full of praise for the evening’s entertainment and happy in having spent an enjoyable Christmas night. On St. Stephen’s Day the weather lent itself for enjoyment of out of door games, and the festivities were brought to a fitting climax that night with a gala dance, the hall being filled to capacity. On Wednesday the men returned to their camps, thoroughly satisfied with the Christmas fare provided by the T.D.B. J. Meehan, and M. Staines, and Assistant Superintendants M. Hogan, W. Fitzgerald, J. Mitchell, J. O’Sullivan. We wish all our readers a Happy and Prosperous New Year.